All hell has broken loose in Raccoon City. Echo Six has been dispatched by the U.S. Special Operations to determine why the city has gone dark, and it doesn’t help that it’s home to Umbrella. SpecOps has a reason to believe Umbrella is behind the things going on in Raccoon City from past reports. 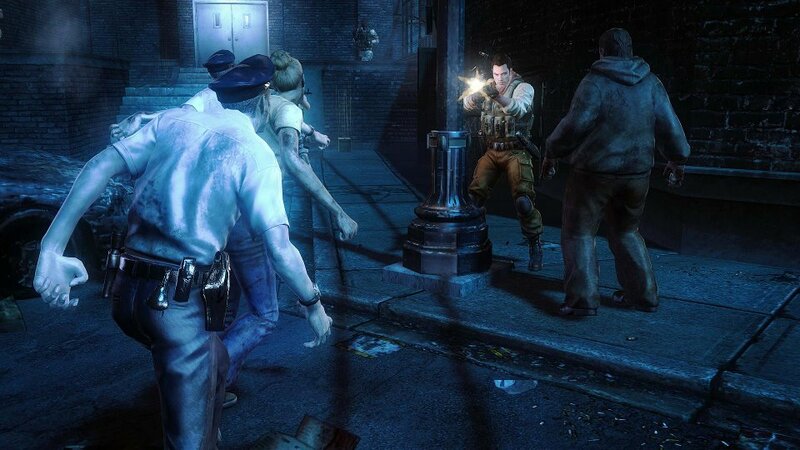 The civilians don’t turn out to be friendly, and a simple intel mission turns into a fight to save any survivors as well as confirm Umbrella’s involvement. Resident Evil: Operation Raccoon City (ORC) gained an expansion in the form of two DLCs that will set the player back only $20. Yet, for just $20, it is an entire new campaign with new characters (originally shown in the pre-release Triple Threat trailer). It’s time to take control of Echo Six and teach Umbrella a lesson. The plot of this game takes place maybe half a day after the events of the primary campaign but catches up to it in the timeline. Echo Six was sent by the U.S. SpecOps in order to find out why Raccoon City suddenly cut communication, and to gather intel on Umbrella’s involvement. Things become complicated as the infected, Nemesis, USS, and a host of other enemies begin to bog things down. The plot of the game is still very straightforward, but is a bit more palatable than the main story. Characters in the game mirror that of their respective class (assault, recon, etc.) from the Umbrella campaign but are much more refined. More personality is displayed by these characters in their dialog as well as how they are willing to ask more questions without disobeying orders. More of the main Resident Evil characters show up, and gain more of a flair in their entrance, with some small explanation of who they are and why they are involved in the story. Audio and visual aspects of the game remain unchanged, while gameplay actually improved. The shooting engine is still the same, but movement feels more refined, and some of the glitches in regards to randomly stopped shots have been considerably reduced. The cooperative AI has also been beefed up, leading to a team that fights more like a team and less like a disjointed android. This makes the Echo Six campaign more pleasing to play than the Umbrella one, which may lead more gamers to play it more than the main campaign. Unchanged audio, many fewer glitches, and more fleshed out characters. The DLC also has much better gameplay with a worthy AI. For the players that liked ORC, this is a DLC that is worth its weight in gold for the additional story line and better play.